Kauri is of natural and cultural significance to New Zealand. It is a keystone indigenous species (Tāonga species) that supports a unique and complex ecosystem. 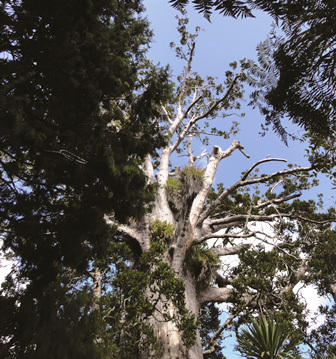 Kauri dieback, caused by Phytophthora agathidicida, poses a serious threat to kauri. The pathogen attacks the roots of kauri, destroying their ability to draw water and nutrients from the soil. The disease causes sap bleeding lesions on the trunk, and yellowing and thinning of the canopy with many infected trees dying. The soil borne pathogen is easily spread through the transfer of organic matter by humans, animals of the transfer of plant based material from infested areas. We are working in collaboration with the Kauri Dieback Programme Tangata Whenua Rōpū.